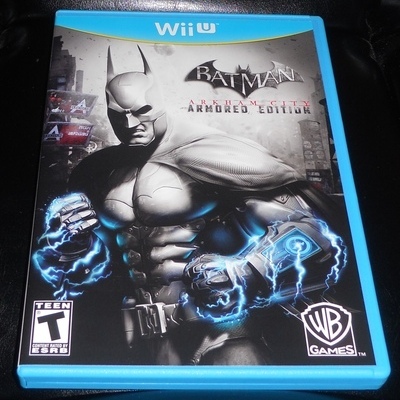 Batman: Arkham City: Armored Edition is a launch game for the Wii U, a highly touted port of Rocksteady's 2011 game. A compact version, collecting everything that other players had to wait months to get (and included on the bottom line; no extra DLC charges, thank you! ), Armored Edition bursts through the wall and silently takes down all of your free time. All of Gotham City's thugs and super-villains are housed in a single area, "a sprawling mega-prison" that Bruce Wayne has been thrown into as well after a brutal kidnapping. Is there no escape?! Not including all of the packs that were given to us off the bat (which allows us to play as Catwoman, too, seemlessly and as part of the main story, not just side stuff), the list of things that this game does well can be quite lengthy. First and foremost, the game controls very well, and fluidly. Often in combat (pictured below), an enemy will come at you with a fists-a-blazing, or some sort of dangerous weapon, and a signal will appear above their head. At this point, you can hit the counter button to turn the tables, and it works even better when you're getting it from all angles. In other games where you'd have to nail it perfectly, here you can just tap the counter button twice in succession, and you pull off a radical double takedown. As someone who has spent some time reading Batman comics, and watching the Batman movies through the years, watching the Caped Crusader dump a pile of thugs in seconds feel second nature. I never found myself saying "would Batman really do that? ;" you may chuckle, but I ask that question of games. Often. Included in this game is the all-new B.A.T. Mode for Batman, a toggle that fires him into overdrive, doing mega-damage. Great for a pinch, but can only be on for so long before running out of juice. Quite helpful. Combat feels like "Batman," and his Gadgets feel like "Batman," too. Straight from the famed Utility Belt, they're all here (and more! ): Batarangs, smokebombs, the grapnel gun (used for grappling to rooftops AND disarming foes in combat), and one of my favorites, the Line-Launcher. Where does he get those wonderful toys? Not included in there, but what may surely be one of Batman's greatest assets is the Wii U GamePad. Working right ouf of the gate, players finally get to experience a map 100% of their playtime without it clogging up the stage. Many games that are map-heavy require oodles of pausing, or an on-screen depiction that is not nearly as detailed as it needs to be. Here a simple slide of a finger can allow you to zoom in heavily to your heart's desire, and even set yourself a custom waypoint (reflected on the TV) so you can get exactly where you need to go. 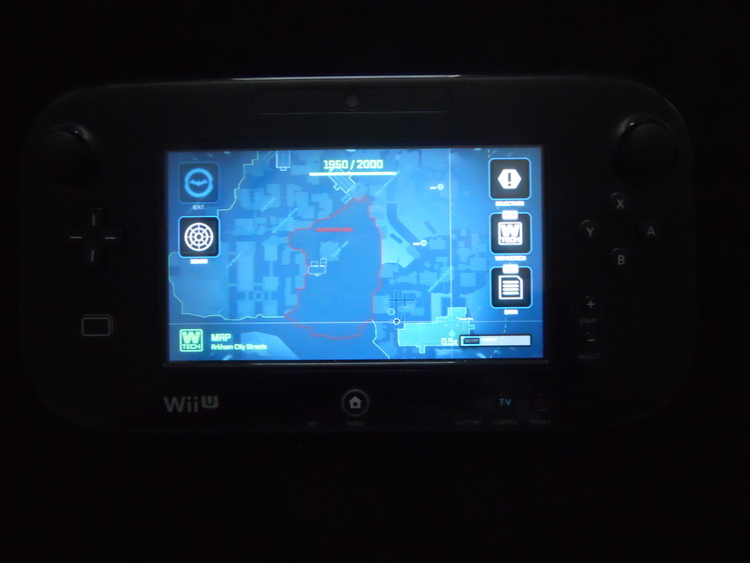 Besides the map, you also have GamePad specific controls that can't be experienced elsewhere. One of the coolest things I got to do (even though I was doing it wrong at first..) was inspect a "crime scene," looking for clues. Aligning the GamePad with the TV, so you and Batman are on the same page, you can navigate the room looking for something that doesn't seem quite right with the dual analog sticks. 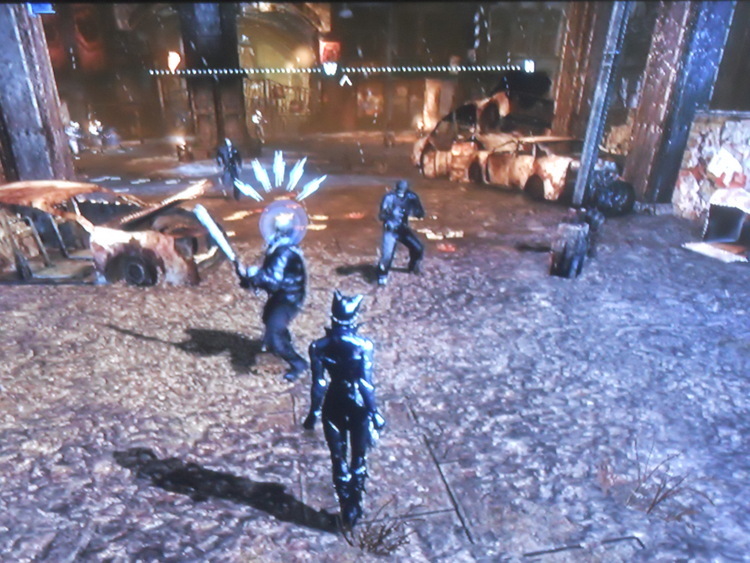 Haha, the way that I was doing it -- and again, this was REALLY COOL so don't laugh -- was standing right in the middle of the room, and using the GamePad like my eyes; I could look where my couch is and see something totally different, completely surrounded in 360 degrees of Arkham City. For a moment, I was Batman (and the bullet hole was near the throw rug, by the way..). A remote control Batarang can be handled in a similar manner; first person view on the GamePad, and steered via analog sticks and/or the accelerometer. Beyond the GamePad, fans of DC and Batman's Rogues Gallery will find much to be excited about here. Sparing the spoilers, I'll simply say that they've dug deep into the bag with some of these guys, and newer / more casual fans of Batman may not even know about these characters. I enjoyed it quite much, sir. Lastly, Riddler has made sure that you never get bored with your Main mission, so he has hidden what seems like a thousand trophies around the City (it's probably more like 300 total, as well as breakable objects, and some Riddles, too). For the completionist, this is..haha, either a nightmare or a dream come true. Getting almost every single trinket in Arkham City, finishing the Story Mode, doing every Side Quest, and some Bonus stuff will only net you about 70% completion (according to my file, anyways), and nearly everything that you can pick up in the City is linked to some unlockable Bonus Material -- score (check out the super-detailed 3D models)! In that, Riddler has also arranged for some Challenge Rooms outside of the main mode promising hours upon hours of combat, skill usage, and predatory takedowns on unsuspecting foes. All of that awesome aside, this is not a game for everyone. The size and scope of the City can be daunting for some, and quite easy to become lost and turned around in seconds flat. Of course, this can be remedied by repetition and simply acclimating yourself to your surroundings, but for the less patient gamer, this is a death sentence. With most true sequels, it is often assumed that you played through the first game and you know how everything works to a T. For Wii U and Nintendo-only fans, this was, and is, impossible. While Riddlers clues and trophies and everything else is enjoyable, there is just sooo much to get. You can take Riddler out of commission before finding every single thing (so you don't need ALL of it..), but after you've got him..the interest just isn't there as it once was. Also, I've been told repeatedly that you can't advance the game or do something that you can't get back to, but I am 100% convinced that you CAN indeed mess up some clues for yourself, and you can do nothing about it. One of Riddlers most challenging..challenges is having you take a picture, so to speak, of a bright green Question Mark -- the squiggly part and a dot (you know, ..like a Question Mark) -- but it can only be captured properly from a unique perspective. This often includes climbing up somewhere high and flying over top, or crawling out on a ledge or something similar. One of the earlier trophies you find (before you might even be aware of this Question Mark business) is glowing green from below the water. Once you collect that trophy, the bottom of your dot is forever lost, and that puzzle is seemingly unsolvable. While there is a NewGame+ mode, the main mode doesn't grant you much variety in standard battle. Some of the boss fights were pretty cool, but you can practically sleepwalk through thug encounters doing the same things you always do. This isn't a gigantic negative for me personally, but I know that some people would find this as unfavorable. As the game goes on, you find yourself facing stronger guys, packing body armor, shielding, or special weapons that require another way to get to them. It is my understanding that NewGame+ gives you these guys straight from the start. The training wheels are off, friend. Something this picture doesn't do well is do the game justice. All things considered, this is probably one of the best games I've played in a while, and the perfect game to launch with the Wii U. Great graphics, great sound (including the ultra-immersive "getting your bell rung," reflected by blurred vision and distorted / dropout sound), a gripping story that kept me guessing and on edge, and a game that you wish you could do all over again for the first time. There are talks of a sequel, but the way that things are nowadays, nobody surely knows what will be available, or when, or if. That said, I'm not really sure how there could be a sequel-sequel as a lot of these things were sewn up pretty tight.. In any event, this game has showed us that Batman and this universe belongs on the Wii U. Should you give it a shot? Absolutely. This was my Game of the Year pick for Negative World, but the bigwigs here disqualified it; fear of the Dark Knight, I guess.. If you're reading this review, you're probably up to the task...unless you just stumbled across Negative World and you aren't sure what you're reading (while you're here, sign up! It is Free and Fun! Have you seen our Newsletter? Wow!). It was a complete joy to play, and if you know me, you know how seriously I take my videogame scoring. My opinion is that there is no perfect 10.0 game out there, but you can get pretty close..and this game got pretty close. Among Chrono Trigger, Final Fantasy III (US), Ocarina of Time, and Monster Hunter Tri, Batman: Arkham City: Armored Edition is the newest addition to my very own hallowed ground. This and Arkham Asylum are amongst my top 3 favorite PS3 games. Glad to see this was a well done port. Good review man. 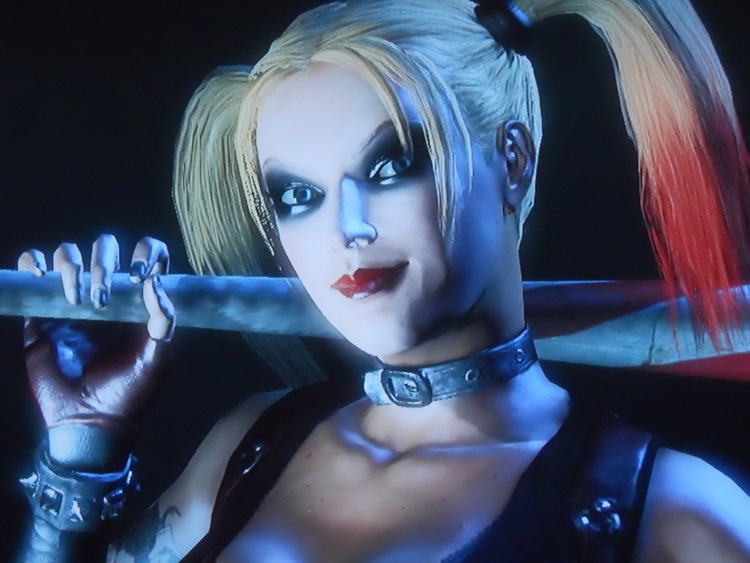 I was just talking with a friend and we both agreed that Arkham City is one of the best games of the generation. It is absolutely fantastic. Great review. Been thinking of getting this but was worried it would ruin my image of the first one. It seems to hold the Arkham name well though. Does it come with "all" the DLC found in the PS3/360 version? Could you explain what the Batman Inc. suit is? I have yet to boot up the Wii U version, so I don't know the answer...but the rest are absolutely on there. Gotcha. I'd assume they're in there (Stache or someone that's played the game can verify), but I was just going from Gamestop's online description and it didn't mention those. I'm glad you enjoyed it. It really is a very good game. Great review. I've heard nothing but good things about this port. What exactly were you doing wrong when scanning a crime scene with the gamepad? That sounds really neat and immersive! Nice write-up. I still feel Asylum was a more cohesive, focused effort while City was in some ways a "good mess", though it still managed to be one of the best 3 games I played in 2011. It improves upon Asylum in a number of ways, but when it was all said and done, I felt that it tried to do too much and suffered a bit as a result. In any event, both are great games, and I recommend anyone check them out if they can. Especially as someone who has always loved Batman but am generally scared away by your typical licensed video game, and especially Batman games historically. Rocksteady has really nailed it, twice now, about how to make a great superhero game. I'll pick this up when I can find it for 20 bucks. Thanks for the review, Stache man. @TheBigG753 Yes, I prefer Asylum as well, it's more "Metroid Prime" while City is more "GTA" or whatever. Still, Arkham City is a darn fine game. Hmm, haven't been in The Cave, but I may not have unlocked that. Admittedly, I have NOT 100%'d the game, nor done ALL of Riddler's Challenges. It is possible that it is in there afterall. (I've noticed that some Sidequests say "noted for more investigation at the Bat Cave" or something, but I was 100% one with it. I guess I can/should sift through there a little more! "Batman Inc." is definitely there (I don't use it, but I've seen it listed too many times to count). 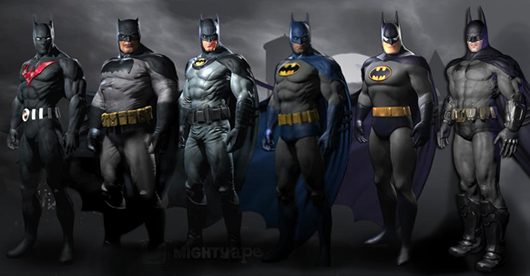 Different costumes for Robin, Nightwing, and Catwoman, too (nostalgia blast from Animated Catwoman, wow), including the original costumes from the original game. HAHA!! You're just "supposed" to use the sticks to turn and look around. The gyro stuff is built-in though, so you can move it and that looks, too. I'd turn a little in my seat, and the game/gamepad screen would only show like a 40 degree change. "What the heck.." So I stood up in the middle of the room, and I could turn completely around, obviously, and at the floor, and the walls, and the ceiling. It really was neat! Thats one thing, I never got to play that. I wonder if it'll make it to Wii U someday, somehow.. They should have had included both in the pack. Really give people a bang for their buck. Batcave is just a predator challenge map. IIRC it was bundled with Nightwing DLC. The whole marked for further investigation at the Batcave on sidequests is the end of those quests and a possible hint at further follow-ups in a sequel or something. This will likely be my next purchase, once I'm done with Ninja Gaiden. Arkham Asylum was very enjoyable and by all accounts City is even better. I also very, very much like the idea of all the DLC being included. I'm on the opposite plan, haha. I don't know if you knew, but I did indeed get Ninja Gaiden for Christmas, and already hopped on to get the DLC. I haven't..really worked with Batman too much lately, so I can probably get going on Ninja Gaiden in the next few weeks. I can always come back to the Challenge stuff though when the mood strikes. Cool beans. I have both the PS3 and PC version of this game and have yet to play either. I should, everyone seems to rave about it. I really like Asylum, never quite beat it, got bored around the ten hour mark however that game was very good as well... though I must say I loved it a lot less than many people seemed to. Part of it is probably that I was never really into the comics. This is the next retail Wii U game I plan to purchase! It sounds like you greatly enjoyed this game, Stache, very good to hear. I can feel your excitement just by reading your review! I also haven't played the previous game in the series. The combat sounds satisfying. And just like Assassin's Creed III, it seems like there is a ton of stuff to search for within a very massive world, making the game a very long experience indeed, if you are going for the 100 %. 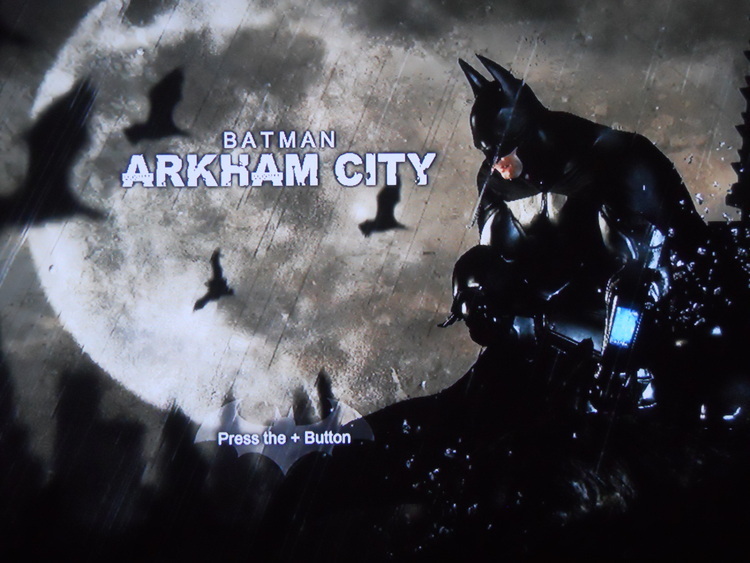 That's pretty neat how you become one with Batman himself as you stood up and looked around you with the GamePad. That kind of stuff works really great in ZombiU also. I understand why people dog the combat, but I think it's amazing. It felt like the first combat system I ever played where it didn't really feel like my main character was just performing the same punching and kicking animations, and if an enemy was there, they'd get hit. Previous combat in games reminds me of the time Bart and Lisa said "I'm going to start kicking this air...and if you happen to occupy the same space as that air, then it's your own fault." The combat in AA and AC is visceral, and it's amazing how the animations link up. It's almost more like a Tony Hawk game. You really feel cerebral and have to plan things out, at least when things seem overwhelming, or you're on hard mode.